KYCH stands for Knights of the York Cross of Honour and is considered by many to be the highest honor that can be bestowed on a York Rite Mason. Unlike many Masonic honors, the KYCH has very specific criteria. To be eligible, you must have successfully completed a term as Worshipful Master of a Symbolic Lodge, High Priest of a Royal Arch Chapter, Illustrious Master of a Cryptic Council, and Commander of a Knights Templar Commandery. If the criteria has been met, the individual must then be proposed and elected to membership. It is an invitational body only and not one you may petition to join. The organization is governed by a national body, "Convent General Knights of the York Cross of Honour," and is organized into local Priories. In Indiana there are three Priories located in Fort Wayne (Indiana Priory #8), Franklin (Robert A. Woods Priory #62), and Portage (J. Herbert Nichols Priory #76). The primary jewel you'll see worn by a KYCH member is the the crown with the symbols for the four prerequisite bodies along the red band. 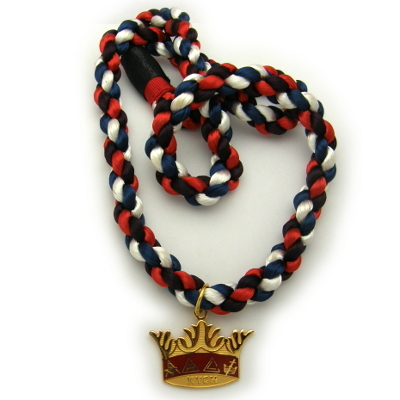 It is worn on a woven cord of Blue (Masonic Lodge), Red (Royal Arch Chapter), Purple (Cryptic Masons), and White (Knights Templars). "The meaning of membership in K.Y.C.H. can best be explained by a closing statement of Most Eminent Knight Donald E. Friend, Grand Master General, at his Convent General Session in 1995, "As a Knight of the York Cross of Honour, you are a proven servant of the Masonic Fraternity , your inspiration has came from your Past, your duty is in the present, your Hope is in the Future, I ask you always to remember悠n all you do, In all you say, In all of your actions, take a good look at yourself, you are someone impression of Freemasonry."